Former Trump campaign chairman Paul Manafort has been sentenced to 47 months in prison for tax and bank fraud. He has also been ordered to pay a $50,000 US fine and restitution of just over $24 million US. Manafort, sitting in a wheelchair as he deals with complications from gout, showed no visible reaction as he heard the sentence. The sentence caps the only jury trial following indictments stemming from special counsel Robert Mueller’s investigation. It was not related to Manafort’s role in Donald Trump’s presidential campaign. In his remarks, U.S. District Judge T.S. Ellis said sentencing guidelines which would have allowed a sentence of up to 20 years were excessive and would have created “an unwarranted disparity” with other cases. Before the sentenced was imposed, Manafort told Ellis, “saying I feel humiliated and ashamed would be a gross understatement.” But he offered no explicit apology, something Ellis noted before issuing his sentence. 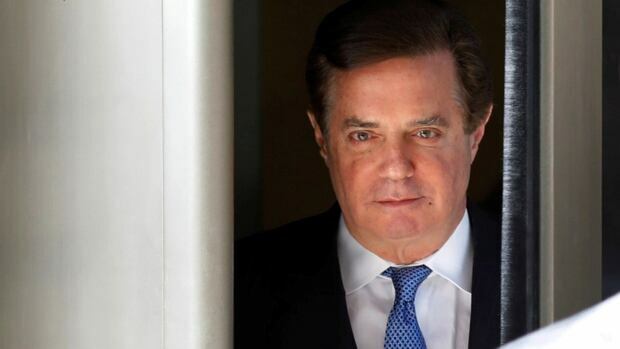 Last year, a jury in U.S. District Court in Alexandria, Va., convicted Manafort on eight felonies related to tax and bank-fraud charges for hiding foreign income from his work in Ukraine from the IRS, and later inflating his income on bank-loan applications. Prosecutors have said the work in Ukraine was on behalf of politicians who were closely aligned with Russia, though Manafort has insisted his work helped those politicians distance themselves from Russia and align with the West. After his conviction, Manafort pleaded guilty to separate charges in the District of Columbia related to illegal lobbying. He faces up to five years in prison on each of two counts to which he pleaded guilty. In the District case, prosecutors say Manafort failed to live up to the terms of his plea bargain by providing false information to investigators in interviews. In the Virginia case, neither prosecutors nor defence attorneys recommended a specific term to the judge in their sentencing memoranda. Manafort’s lawyers sought a sentence significantly below the guidelines, based on a number of factors. First, they said Manafort has suffered serious health problems since he has been incarcerated, mostly in solitary confinement, at the Alexandria jail where he awaits sentence. They said he developed gout and suffers debilitating foot pain as a result, and that he is experiencing feelings of claustrophobia and isolation. Prosecutors said the claims of health issues have not withstood scrutiny and even if they did, poor health is not a reason to escape consequences of criminal conduct. Defence attorneys also complained that Manafort was unfairly snared by special counsel Mueller’s investigation into whether Russia meddled on Trump’s behalf during the 2016 presidential campaign. They argued that Mueller went beyond the scope of his mandate to investigate Manafort. Even Ellis, at the outset of the case, speculated that prosecutors’ true motive in prosecuting Manafort was to pressure him to provide evidence against Trump. Prosecutors disputed that, and in court filings said Manafort’s business dealings were under investigation even before Mueller was appointed as special counsel. Defence lawyers also cited the fact that Manafort forfeited millions of dollars in cash and property as a result of his convictions, and suffered public shame as a result of his high-profile prosecution. Government lawyers countered that Manafort’s millions were built on a criminal enterprise in which he hid tens of millions of dollars in foreign income and failed to pay more than $6 million US in taxes. “Manafort has failed to accept that he is responsible for the criminal choices that bring him to this Court for sentencing,” prosecutors Uzo Asonye, Andrew Weissmann, Greg Andres and Brandon Van Grack wrote in a sentencing memo Tuesday.